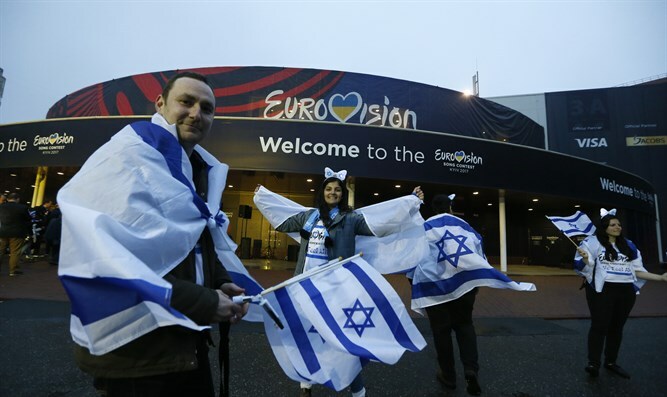 MainAll NewsEuropeEurope panics: Has Israel quit Eurovision forever? Europe panics: Has Israel quit Eurovision forever? Israeli broadcaster tried to explain that official broadcasts have stopped, but was misunderstood in a big way. Israeli fans at the Eurovision's International Exhibition. Israel doesn't cease providing headlines. A report headlined "End of an Era" on The Sun's Showbiz site Saturday night blared that "Israel quits Eurovision 2017 live on air after 44 years." The sub-headline then "explained" that "Israel has withdrawn from the annual singing competition after the closure of public broadcaster IBA." What the reporter did not understand was that since IBA is closing, this was the last Eurovision contest that it was broadcasting – but Israel itself will continue to participate in the competition. Israel Broadcasting Authority Broadcaster Ofer Nachshon was given the floor on the Eurovision broadcast to explain that this was the last time that Eurovision would appear on the IBA. "Israel has been participating in this platform known as Eurovision for 44 years. We have won three times in the past, with songs such as Halleluy-ah, Abanibi, and Diva. But this evening is our last evening; very soon the IBA will cease its broadcasts. "We are ending the public broadcast and I hope that next year the competition will be broadcast by the broadcasting authority that will open in the future. In the name of all of us here at the IBA, I wish to say thank you, Europe, on all the magical moments and wonderful times. "The employees of the IBA thank Eurovision and part from you. I hope we will meet again next year." MaarivOnline reports that the announcement was a "shock to some of the viewers." At least two European news sites immediately reported that Israel had quit the Eurovision contest forever. It would seem that the error is at least partially due to the undue importance given by IBA employees to the closure of their station and its replacement tomorrow by a new broadcasting cooperative. IBA television and radio announcers over the past several months, and especially the last few days, have repeatedly and emphatically made known their resentment of the closure. The new body will begin its TV and radio broadcasts Monday, after the IBA was found to be overstaffed and wasteful of resources and public funds. An Arutz Sheva query as to how many labor unions are active in the IBA received three different answers from three different sources. All sources, however, agreed that the number of active labor unions in the IBA was greater than ten.